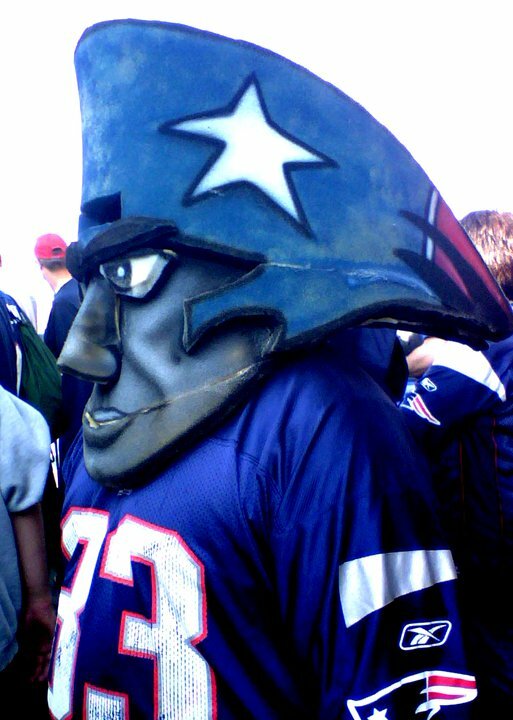 Red Sox Opening Weekend Photoblogging, Part 2 - Cursed To First - Sox and Pats forever. 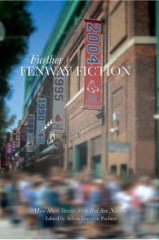 The logistics of Fenway Park, however, did not exactly feel like they had been designed with the fan in mind that night. The Sox have gone to a new system this year of opening only two gates, A and D, two hours before game time for extended batting practice. Hence the above-pictured CF at gate A two hours before game time. Sam and I ended up getting trapped accidentally in the line that was supposed to be for will-call, which was being serviced by exactly one bag-checker and one ticket-scanner, the latter of whom showed no signs whatsoever of any urgency. After a while, Fenway Security slammed the rolling gate shut behind us to try to keep more people from going in via that gate, meaning we were stuck with at least a few dozen other people in a space roughly the size of my living room, locked in by gates and ticket turnstiles on all sides. Not a fire hazard at all! And whoda thunk this many people whould show up early for the rubber match of the Opening Weekend Yankees series? Surely no human mind could have predicted that...Sigh. Like I said, it was a CF. And I hope they will strongly reconsider whether or not this new system is that great an idea. 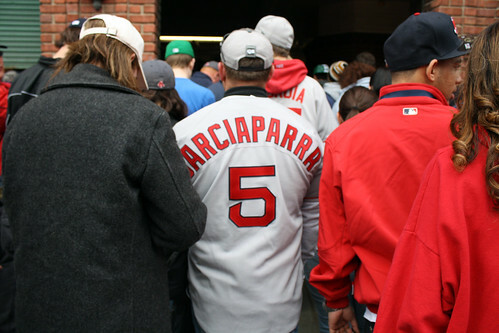 Anyway, this picture also shows one of the unusually high number of Nomar jerseys I noticed around us at this game, which was weird. 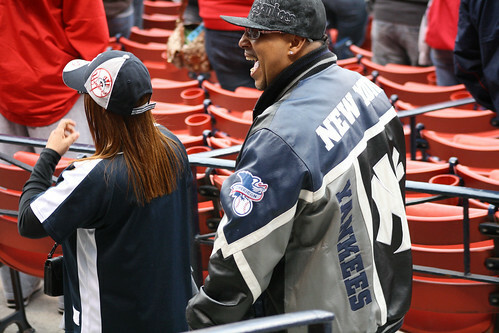 Once we finally got into the park, it became clear that we were near-overrun by Yankees fans...and this guy, if I were in charge of the dictionary, would have his picture next to the definition of "Yankees fan." Her name is Michelle Brooks-Thompson, she lives in Sunderland, Mass., and she won the Sing Your Way to Fenway contest with the Red Sox. 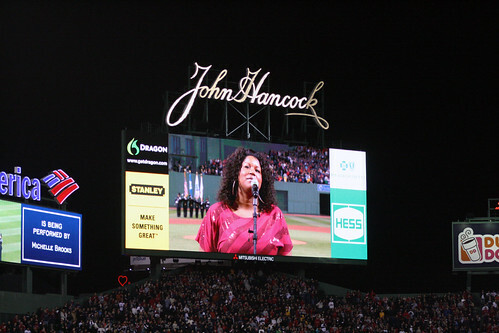 She sings gospel music every Sunday at Holy Trinity Church of God and Christ in Springfield, Mass., and this past Sunday night, she sang one of the best National Anthems I've heard, at Fenway, or anywhere else. Here's a YouTube video of her performance. The sound quality isn't great, but it gives you some idea -- and shows you how the crowd at the park reacted to her. You'll also notice how completely quiet it is between whoops and cheers for her more powerful notes -- everyone was riveted. And at the end, they didn't cheer over "land of the free and home of the brave" just because it's traditional to do so at ball games -- they were cheering for HER. Another great moment before a pitch in anger had even been thrown. 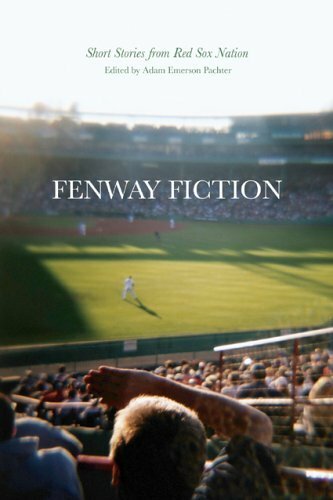 Bridget Johnson was told two days ago that the Boston Red Sox had invited her to throw out the ceremonial first pitch prior to Sunday night’s game against the New York Yankees at Fenway Park. 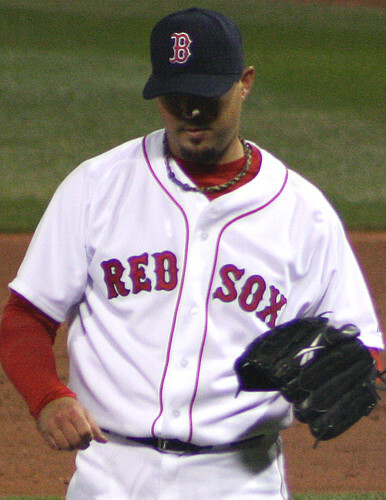 Johnson, 11, is the daughter of Red Sox first-base coach Ron Johnson. She lost her leg in a car accident last summer while riding her horse and was recently fitted with a prosthetic left leg. Prior to the game, Bridget, her older sister Cheyenne and her mom Daphane sat in the dugout. Numerous Red Sox and Yankee players came over to wish Bridget well before her father escorted her out to the mound. Ron Johnson did not know until moments before that Bridget was throwing out the first pitch. The Red Sox flew the Johnson family up from their home in Tennessee on Saturday for the special event. Red Sox third baseman Kevin Youkilis, who bought Bridget a new horse, caught the pitch, then gave Bridget a big hug. Bridget named the horse Youkie. 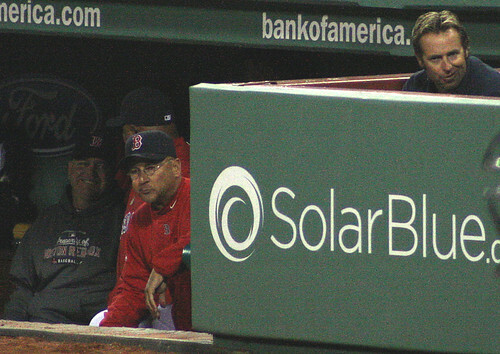 Another special guest at this game was everybody's favorite, Kevin Millar. 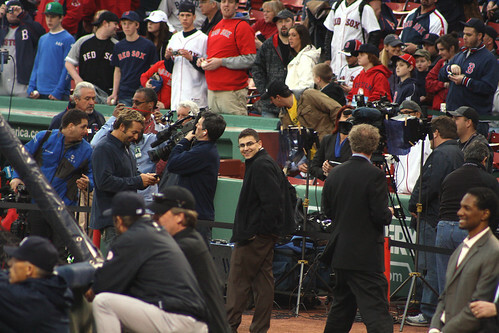 The above shows my favorite Millar moment of all -- when Kevin, without looking up from his cell phone, had Something to Say to Dan Shaughnessy on his way by during BP. I obviously didn't hear what it was, but it very clearly got the attention of the guy shown standing in between them in the photo above, as well as Shaughnessy himself, who turned to respond immediately, and eventually gave Millar (who smiled and ignored the rebuttal) a palms-up "WTF" gesture. Look, Millar just rules. 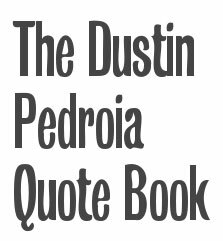 He can come to Fenway anytime, as far as I'm concerned. And I hope he'll either be on TV more often, or consider coaching at some point...I think he'd be great at either one. "Sir, will you please stop bothering Mr. Francona?" 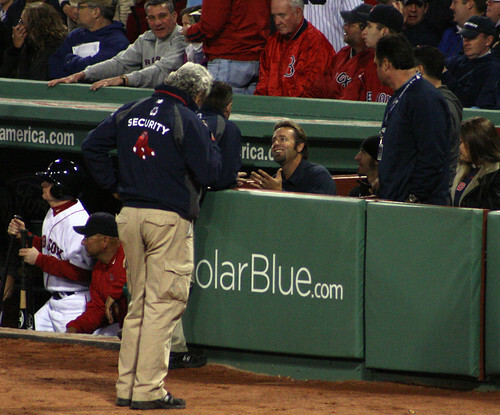 Whatever Fenway Security was saying to Millar in the photo above this one, it didn't work -- we noticed Tito was not in his chair most of the night, and instead was kind of hunched over on the stairs. We can only conclude he was hiding from Millar's non-stop verbal onslaught (but note the barely-repressed smirk on his face as Millar jaws on with Sully from Godsmack here). 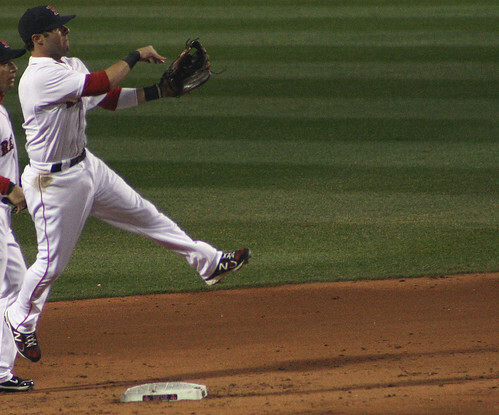 Meanwhile, did you know that Dustin Pedroia has acquired the power of flight? Well, now you do. Rays looked aerlly bad in the 1st, but Ben just uncorked a long one into the right field seats! What a shot!